A cheese tasting experience unlike any other: Cantalet Dore, Petit Basque, Sottocenere, and Comte Extra are paired with quince paste, orange blossom honey, and more, presented in a tailored isothermic cooler. 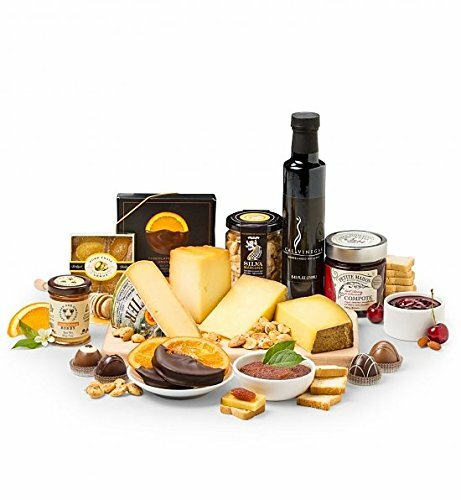 Included in this Gift: Artisan Cheeses: Cantelet, Petit Basque, Sotocenere and more. Quince Pate, Marcona Almonds, Barrel Aged Balsamic. Orange Blossom Honey, Petit Toasts, Cherry Almond Compote. A quartet of imported cheese and gourmet accompaniment ready for tasting in a keepsake isothermic cooler. Artisan Cheeses: Cantelet Dore, Petit Basque, Sotocenere and more. Marcona Almonds, Tart Cherry & Almond Compote, Quince Pate. GiftTree's Signature Isothermic Tailored Cooler. Each gourmet item is carefully assembled inside this isothermic cooler to safeguard the shipping process. A free card is included with your personal message or greeting, as well as complimentary scissors so your recipient can easily open their gift.